Master in Tourism and Hotel Management (MTHM) is a 2-year post-graduate course in the field of tourism and hotel management. The eligibility for the course is a bachelor’s degree in Tourism and Hotel Management or any equivalent degree with minimum 50% marks. The course is spread over 4 semesters. The admission process to the course depends on the eligibility for the course. However, different colleges and universities conduct different entrance examinations for the admission to the course. Master in Tourism and Hotel Management (MTHM) course is suitable for candidates who wish to explore the tourism and hospitality industry. The average tuition fee charged for the course in India ranges between INR 10,000 and 2.5 lacs for a span of 2 years. The students can become Restaurant Manager, Assistant Material Manager, Tour Management Executive, Housekeeping Manager, etc. after successful completion of Master in Tourism and Hotel Management (MTHM) course. 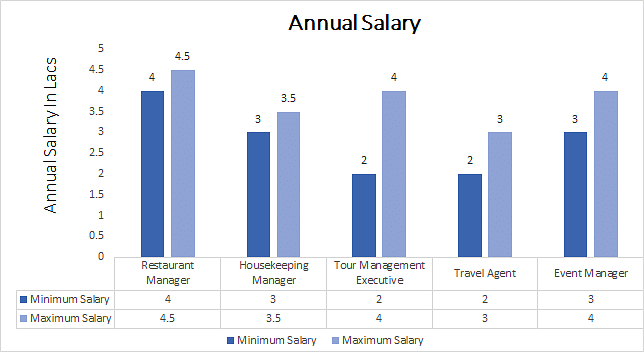 The average annual salary offered to such professionals ranges between INR 2 and 5 lacs, increasing with candidates’ experience and expertise. Eligibility Bachelor's degree in degree in Tourism and Hotel Management or any equivalent degree with minimum 50% marks. Top Recruiting Companies Travel Agencies, Hotels, Restaurants, Aviation Companies, Tour Operating Companies, etc. Job Positions Restaurant Manager, Assistant Material Manager, Tour Management Executive, Housekeeping Manager, Managers, Advisors and Consultants, etc. Master in Tourism and Hotel Management (MTHM): What is it all about? Master in Tourism and Hotel Management (MTHM) is a 2-year post-graduate course aimed at developing core Hospitality Management among the students. The course is designed to provide in-depth knowledge about the management strategies in the tourism and hospitality management. The program provides both theoretical and practical knowledge of hospitality management to the students by exposing them to real situations and the environment in a hotel. Master in Tourism and Hotel Management (MTHM) students are trained for different situations in the tourism and hospitality industry. On the other hand, the program also focuses on the methods of managing the tourists and providing the best services. So, the program basically aims to prepare the candidates with the management skills for handling tourists or customers in the hotels, resorts, etc. Master in Tourism and Hotel Management (MTHM) program prepares the students to be placed on leading management positions in Hotels, restaurants, tourism agencies, etc. Some of the subject areas which the course covers are- Management, Fundamentals of Tourism and Hotel management, human resource management, managerial economics, etc. A candidate must have passed his bachelor's degree in Tourism and Hotel Management or any equivalent degree with minimum 50% marksto be eligible for this course. The admission process does not require the candidates to clear any common entrance examination but different universities & colleges conduct separate entrance examination for admission to Master in Tourism and Hotel Management (MTHM) course. The candidate is required to fulfill the minimum eligibility conditions for the course and qualify the entrance exam in order to get admission. The candidates pursuing Master in Tourism and Hotel Management have numerous career opportunities. They can get jobs in Travel Agencies, Hotels, Restaurants, Aviation Companies, Tour Operating Companies, event management companies, visitor bureaus, etc. Master in Tourism and Hotel Management (MTHM) program prepares the students to be placed at top management positions in the tourism and hotel industry. Different job roles of a candidate completing the course are- Restaurant Manager, Assistant Material Manager, Tour Management Executive, Housekeeping Manager, Managers, Advisors and Consultants, Assistant Material Manager, Professor, Travel Agent, etc. A student can opt for further studies like research in the field of Hospitality Management and tourism.